Knots in yarn are inevitable. It happens with both expensive and cheap yarns. It happens with both commercially spun and hand spun yarns. I am not talking about a tangled wad of yarn barf. I am talking about the place in a skein of yarn where two ends are tied together. When I first started knitting, I got very frustrated when I found a knot (or two, or three) in my yarn. First I thought it was just because I was using cheap acrylic yarn. As I got into more expensive and natural fiber yarns, I continued to find knots! I thought, how can there be knots in this $25 silk yarn? It was maddening to find these knots and I didn't understand why. I spend a good deal of time on knitting forums, and have seen many people ranting and raving and swearing to never purchase yarn from this or that particular brand ever again because of knots. I've also read blogs or seen videos where people say you should not ever find knots in your yarn, and yarn with knots is poor quality. It is nice to have knot free skeins, but to expect to have one long perfect strand of yarn each and every time I think is a little unreasonable. I've realized over the years that just because yarn is expensive, it doesn't mean that at some point, the manufacturer didn't have to join a new strand of yarn to complete the skein of yarn. Or perhaps, as the fiber is zipping through the machines, it breaks. Enter the KNOT. Often the two ends are just tied together; some yarn that I have knit with has had the two ends joined with the little bits trimmed off so the joins aren't so noticeable. Knots happen, and it isn't worth getting so upset over. When I come across a knot, I simply untie it if possible, and then continue on with my knitting. If I can't untie the knot, I just cut it out. The joins that have been neatly trimmed by the manufacturer I don't bother to do anything at all with, I just knit right past them. I no longer get frustrated or angry and accuse my yarn of being cheap garbage - to a point. Generally, I don't mind finding four or so knots in my yarn. More than that, I do get a little annoyed at having to stop knitting to deal with it, but I try to not let it get to me too much. Sometimes I do think when there is a particularly bad skein with knots every few yards, those should be discounted. I don't know what happens, but on occasion the whole shebang comes out screwy. I pity the poor person who buys a large quantity from that batch; I suspect those are the folks doing much of the ranting and raving. 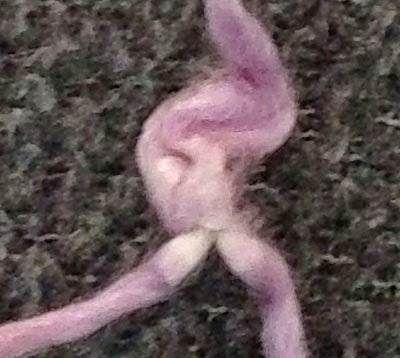 I've said before that it would be nice to know beforehand if a particular skein has knots, but I guess we, as crafters, are supposed to be aware that such things can happen. OK, I am aware that knots happen - I'd still like to know beforehand. Selling my own hand dyed yarns, I do try to catch these things and make note so people know what to expect. I think that is only fair. If you purchase yarn that comes in hanks, you know that you must wind them before using them; this is when you will find any knots in the yarn so you won't be surprised. If you typically purchase yarn that is ready to knit from, you won't discover the knots until you come to them, or you can rewind the yarn to check for knots. That may seem like a hassle, but if you don't want to be surprised, it is time well spent to rewind. Above I mentioned how I deal with knots when knitting. If you crochet, here is a post with some helpful info. What do you do about knots in your yarn? Leave me a comment below, I'd love to hear your thoughts.